Free dimmable LED light bulbs, provide plenty on brightness to makeup in dark. They can be touched and don' t hurt your skin. Rest assured to enjoy make-up trip. 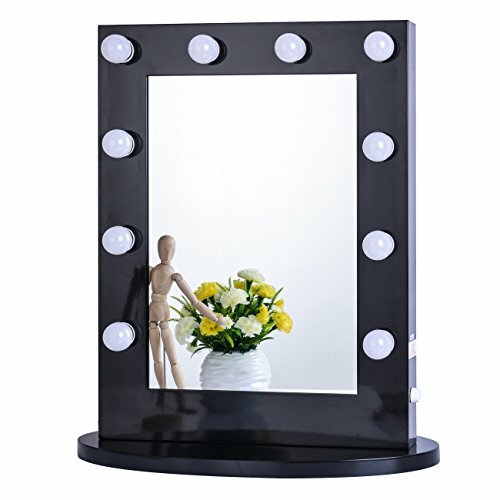 Gloss black aluminum frame elegantly design, detachable wood base of antisepsis, standing on table top or easy be hang the mirror on the wall. Easy to install in a few minutes. Front on/off rotary dimmer switch, could be freely adjusted the brightness you need to show the perfect makeup. Allows for easier makeup application or any of your grooming needs with Hollywood style mirror. Perfect size to makeup and shows the star vanity feeling. Mirror size ( 25.6" x 19.7" x 2.4" ) and oval base size ( 26.77'' x 22.83'' x 0.98'' ). View More In Vanity Mirrors.